Fighting has forced more than 30,000 people from their homes this month in northwest Syria, home to the country's last major rebel stronghold, the United Nations said Monday. The regime and its ally Russia have increased their bombardment in the past few days on the region, which includes most of Idlib province and parts of adjacent Hama. "We're deeply concerned about this recent escalation of violence, which has resulted in the displacement of over 30,000 in the area," said a spokesman for the UN humanitarian coordination agency, David Swanson. "That's something we're monitoring very closely," he told AFP. In recent weeks, regime troops have massed around the northwestern region held by jihadists of Al-Qaeda's former Syrian affiliate as well as rival rebels. Idlib and surrounding areas are home to around three million people -- around half of them already displaced from other parts of the country, according to the United Nations. 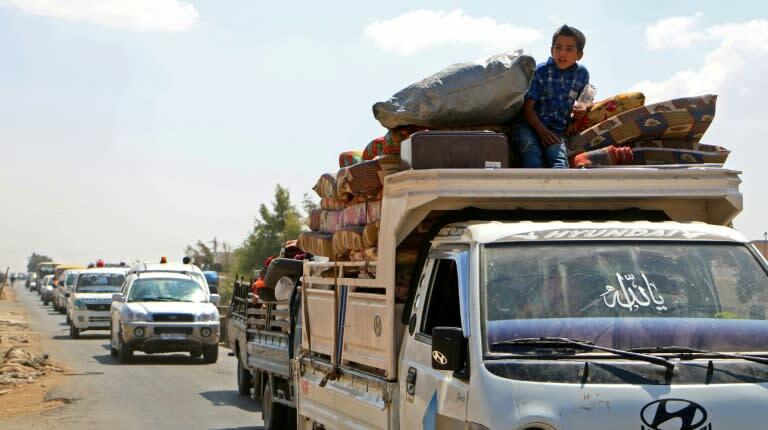 From September 1 to 9, "we have 30,542 women, children, and men who have been displaced from southern and southwestern Idlib and northern and northwestern Hama", Swanson said. "The majority of the displaced have arrived in northern Idlib in communities close to the Syrian-Turkish border," he said. The UN's new humanitarian chief Mark Lowcock warned Monday that a large-scale military operation against Idlib could create "the worst humanitarian catastrophe" of this century. "There needs to be ways of dealing with this problem that don't turn the next few months in Idlib into the worst humanitarian catastrophe with the biggest loss of life in the 21st century," he said. More than 350,000 people have been killed and millions more displaced since the war started in 2011 with the brutal repression of anti-government protests.